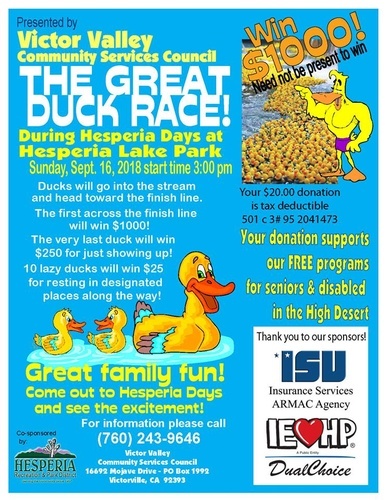 he Great Duck Race is a race of rubber duckies that happens at Hesperia Days. It is a fundraiser for the Victor Valley Community Services Council. Tickets to sponsor a duck in the race are $20. This is a tax deductible donation that helps support free services to High Desert senior citizens and persons with disabilities. The winner gets $1000 and the last place duck gets $250 with 10 $25 prizes also. You DO NOT need to be present tp win and tickets are available now. Thank you to our sponsors ISU Armac Insurance, IEHP Dual Choice, Bounce Realty, Marlo Cales Notary, Patty Markby Best Life Health Coaching, Don Ferraresse Charitable Foundation, Menchies Yogurt, Perfect Clean! And Hesperia Parks and Recreation We still have some sponsorships available! Tickets to sponsor a duck in the race are $20.